Aqua Surf is wholeheartedly committed to lending a hand wherever we can. We truly believe that giving back helps to make the world a better place, and seize every opportunity to contribute our time and knowledge to the world. Because it’s the right thing to do. We’ve worked with a number of charities, non-profit organizations, and cleanup groups both in Santa Monica and Southern California. Our instructors are trained to teach every kind of student, and we are constantly striving to set a good example within our community. As shown in our work with the Braille Institute, beach clean-ups, free yoga, and more. Serving our community is something we take great pride in doing. We want to encourage everyone to experience the thrill of surfing, so we offer discounts and scholarships for low-income families to take lessons. In order to qualify, a single parent must document their income of $30,000 or a couple must document an income of $60,000 or less. Proof of income must be provided based on the previous year’s tax return. We are generous and flexible under these circumstances, and we offer discounted prices or full-ride tuition based on need. We want to make lessons possible for everyone. 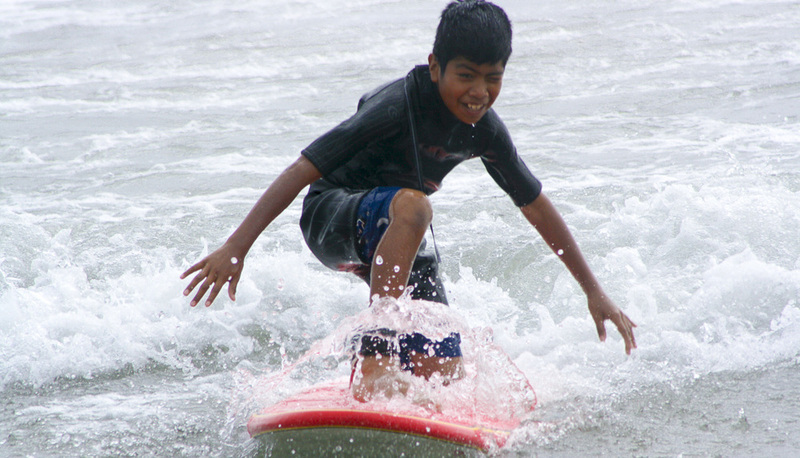 Every summer, we love teaching the wonderful kids at the Braille Institute who are blind or have extreme sight loss experience surfing. Their mission is to eliminate any barriers to leading a fulfilling life, and we genuinely support their cause. Aqua Surf School and Exhale Yoga teamed up to run a complimentary yoga-surf camp during the summer. The two practices synergistically work together and help enhance the other. We worked with After School All-Stars, a program that operates in communities that are with the greatest needs and fewest resources, on a custom surf camp. Their goal is to enlighten and inspire young people by providing dynamic and exciting opportunities for success, while cultivating self-esteem, leadership and respect to help build healthier communities. Aqua Surf volunteered instructors for the Veterans Affairs Adaptive Surf program, a learn-to-surf camp for men and women with physical and psychological impairments as paralysis, stroke, visual impairment, amputation, Traumatic Brain Injury, PTSD, burns, and other complications. Instructors use precise sensory communication to guide and encourage students through the process. Our team is always open to working with new organizations to establish meaningful partnerships. We aim to make the largest impact with our specialized resources. Please get in touch if you'd like to provide a corporate sponsorship or work together to make a greater positive impact.